USB computer connected 3Mpixel camera is included. Laptop is not included. Ideal for Study of Tissue Cultures, Advanced Biomedical Research, Research in Biology, Cytology, Oncology, Haemotology, Genetics, Immunology, Environmental Protection, and Microchemistry. Inverted Design allows for Viewing from the Bottom of the Dish. Perfect for Examining Liquid Deposits! Phase Contrast Illumination technique for observing translucent low contrast living specimens! Compare to Similar Units costing $6,000 with Name Brands! 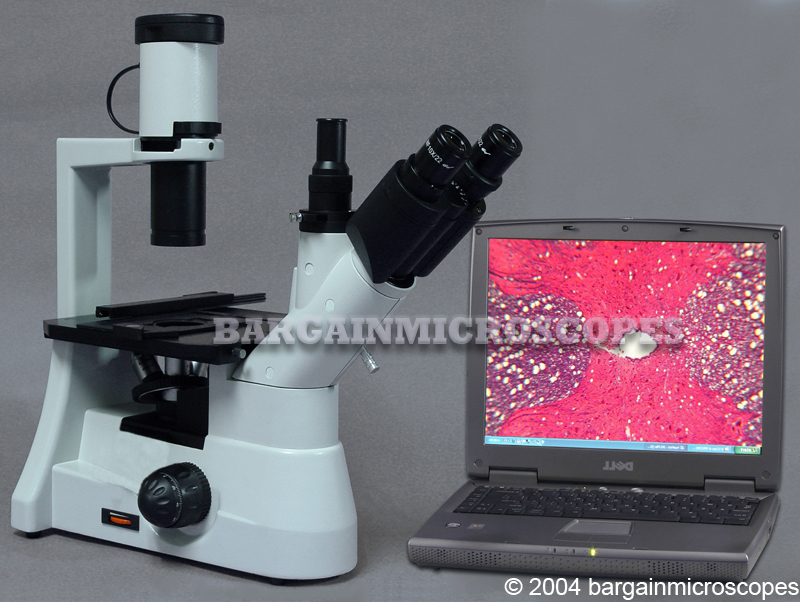 Tissue cell culture microscope for viewing live cultures. Higher grade Infinity Corrected optical system. This type of optics is more expensive than normal fixed tube length optics. 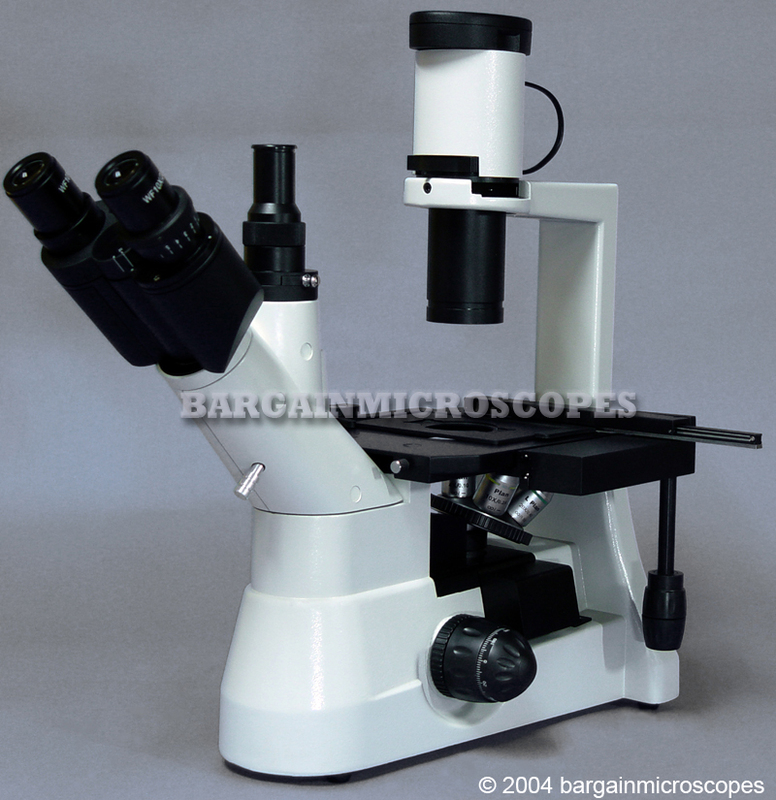 It is found only on higher grade compound light microscopes. Features 30mm Eyepiece Ocular Tubes! Most compound scopes are 23mm. The larger size allows for less eye strain, much easier viewing, and a larger and better quality image! After looking into these awesome eyepieces, you would never want a smaller 23mm ocular! Before buying a different scope, ask if it has the cheap 23mm oculars! Unique Ability to have Image in Both Oculars and Photo Port Simultaneously. This is Perfect for Training as the Binocular Eyepieces can be viewed by the Instructor, and Everybody Else can Watch the viewing screen. Most Trinocular Scopes lose light in one or both oculars when light is diverted to the photo port. High Resolution 3.1 MegaPixel Digital Camera System. 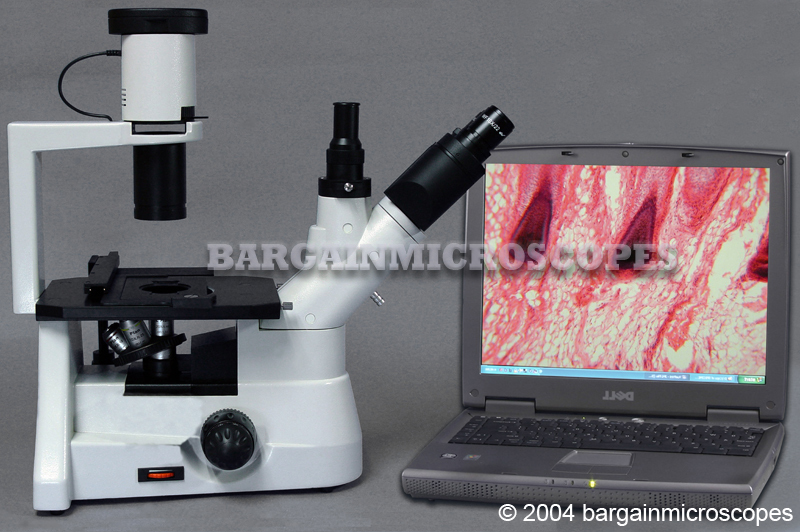 Complete Digital Microscopy Solution Included. 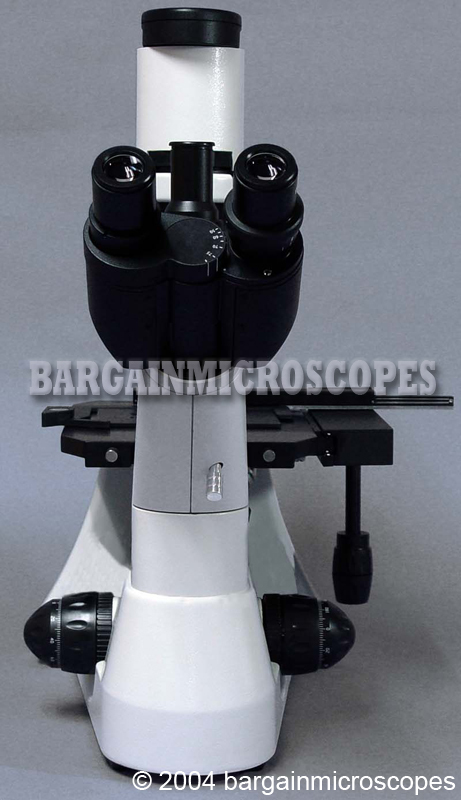 Capture high resolution digital microscope images, 2048×1536 pixels. 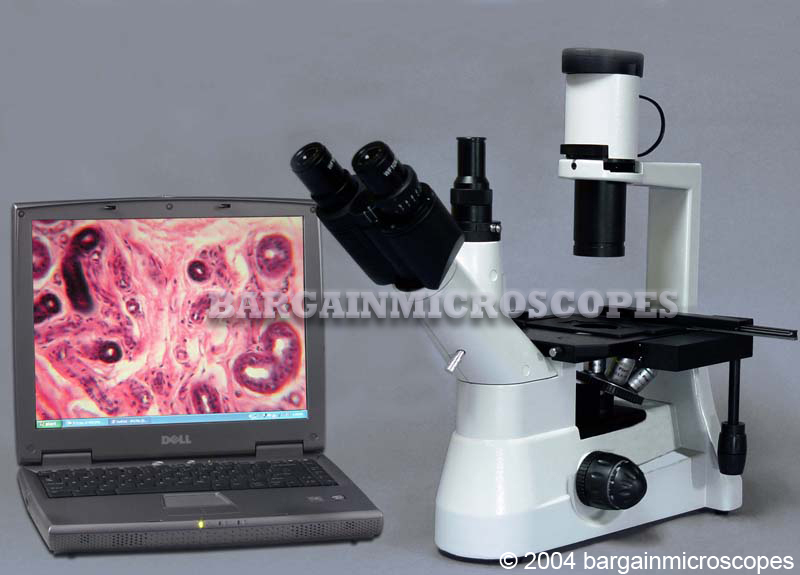 View and record full motion live video microscope images. Frame size options for video mode: 2048X1536 (up to 11 FPS, depending on PC), 1024 X 768, 640 X 480, 512 X 384. Computer connected digital microscope camera connects via USB2.0. Includes USB cable and MS Windows software. Color DSP built into camera provides sharp quality color images. Image sensor size is half inch. Includes measuring capability with the software. Four Brightfield Transmitted Light Magnifications: 40x, 100x, 200x, and 400x. Four Brightfield Long Working Distance PLAN Infinity Corrected DIN Objectives: 4x (0.10 NA), 10x (0.25 NA), 20x (0.40 NA), 40x (0.60 NA). Three Phase Contrast Magnifications: 100x, 200x, and 400x. Three Phase Contrast Objectives: 10x, 20x and 40x. These are the same as the brightfield objectives. 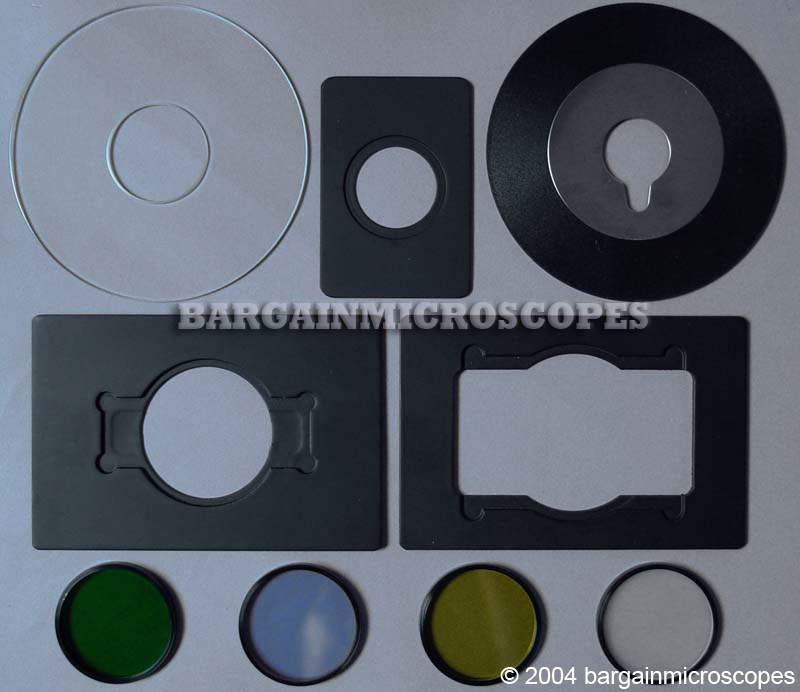 They are used for both brightfield microscopy and phase contrast microscopy. Quintuple objective nosepiece holds up to five objectives. 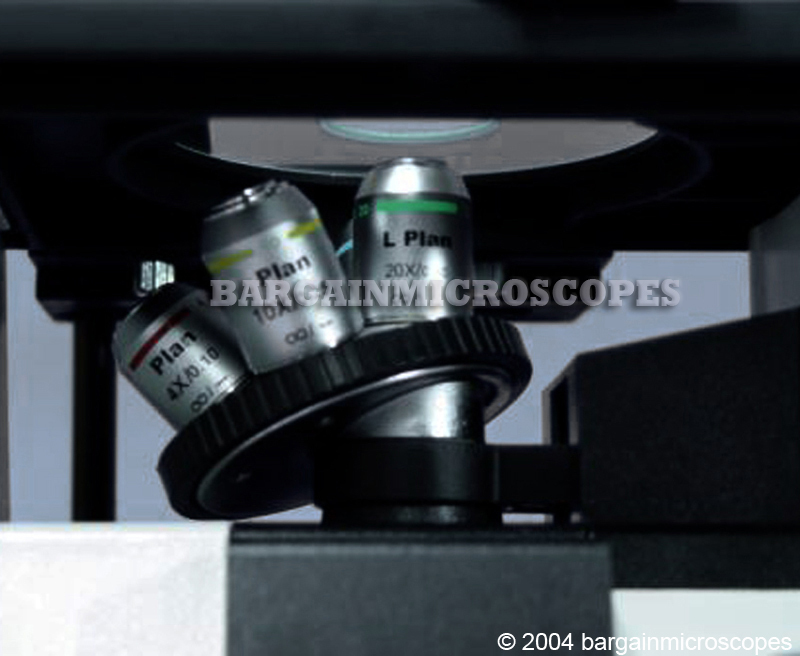 Objectives are designed for being able to view the culture specimen through the bottom of the petri dish or glass flask. 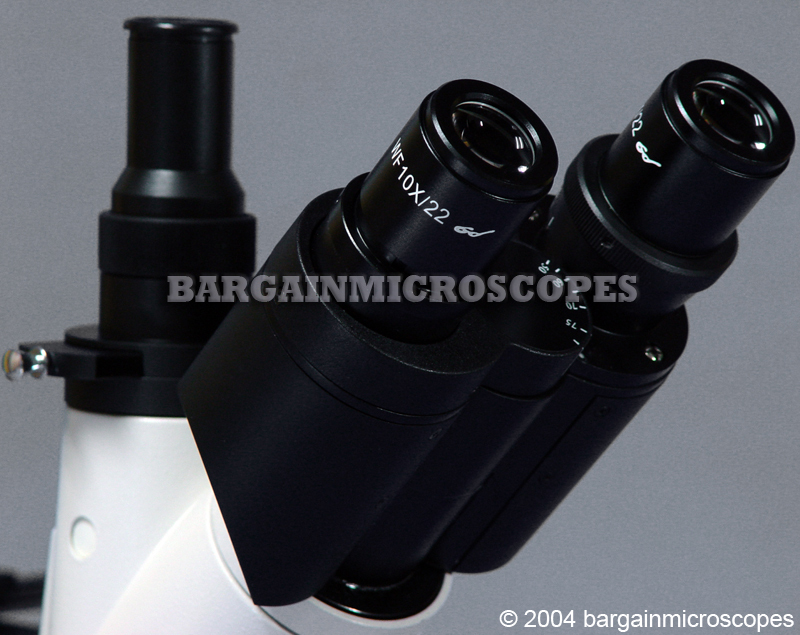 Eyepiece Set Included: 30mm diameter wide field 10x / 22mm Field. High eyepoint eyepieces, great for users with eyeglasses. Includes rubber eyeguards for blocking stray light. Above Stage Transmitted Light Source: Variable Intensity 12V/30W Halogen Illumination. Above-Stage Long Working Distance (75mm from stage to bottom of condenser) Condenser, with iris diaphragm and filter holder on slider bar. Phase Annulus Rings for 10x, 20x, and 40x built into phase slider bar. Slider bar has open hole for brightfield setting. This same hole can be used for placing a brightfield color filter. Ring Centering Knobs for Precise Alignment of Phase Rings for Optimal Phase Contrast Performance. Four brightfield filters included: Slight Blue (for daylight color correction), Green, Yellow, and Frosted White. Trinocular photography port has a color corrected daylight filter that can be inserted into light path or removed. Large Mechanical X-Y Movable Stage. Stage dimensions: X = 172mm, Y = 240mm. Low Position Coaxial X-Y Specimen Holder Movement Knobs – Range of Movement: 70mm (X-Direction) x 120mm (Y-Direction). Includes several types of holders for slides, petri dishes, and flasks. Stage does not move up and down. Instead, the objective turret moves up and down to focus. For Optimal Performance when Focusing, the Objectives move Up/Down Instead of the Stage. 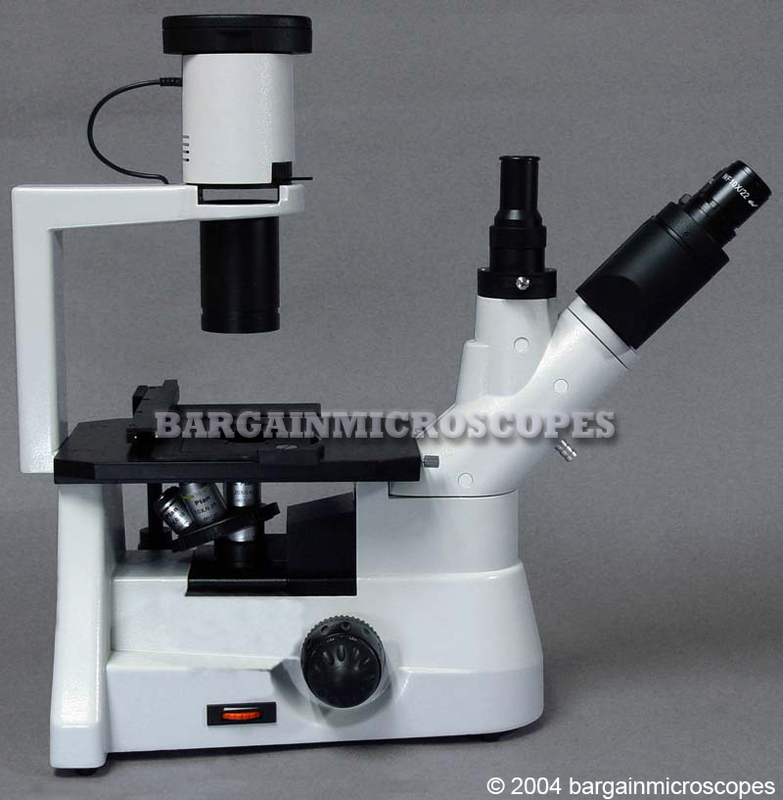 Total Overall Height of Microscope: 490mm. Includes: Dust Cover, Extra 12V/30W Bulb (for brightfield), and Extra Fuse. 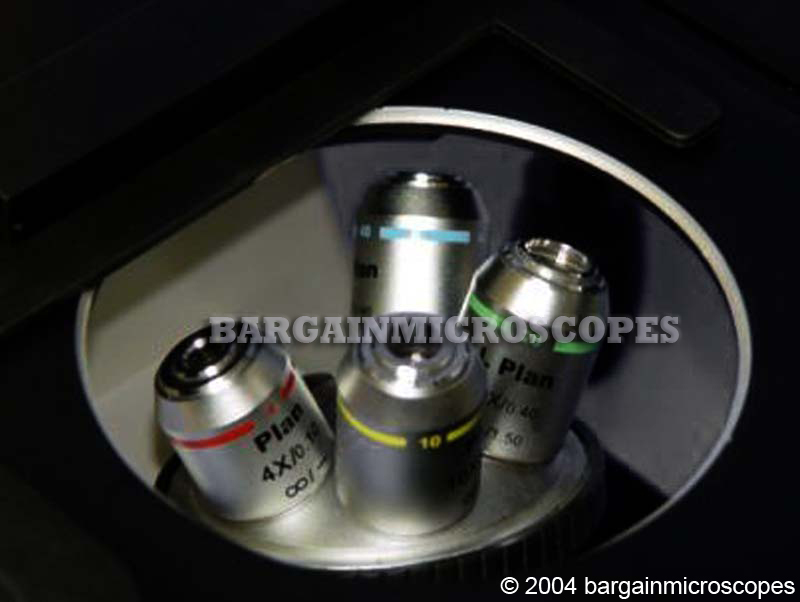 Includes phase contrast telescope for centering of phase annulus rings with the phase objectives. 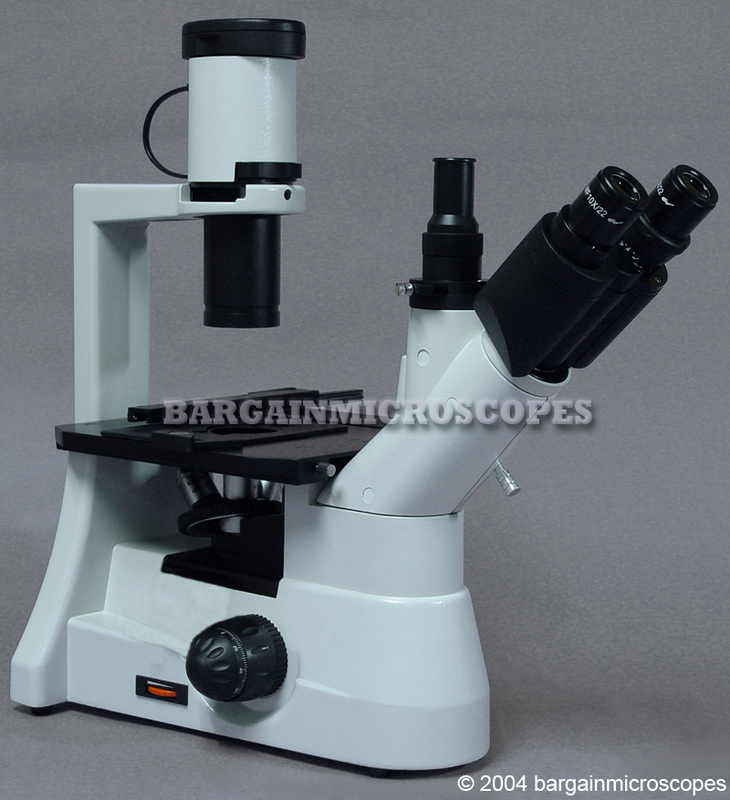 1 Year manufacturer’s warranty on microscope and accessories. Manufacturing defects are covered. Damage from abuse is not covered. If you need servicing, simple contact us for repair or replacement.